MySliceFest will take place on Saturday 30th July at Wembley Park. It will be London’s largest outdoor pizza festival; combining live music, DJs, games, rides and the all important pizza. Independent pizza brands from across the country will showcase their popular and exclusive toppings to up to 10,000 customers at MySliceFest. The brands are: Scream For Pizza, The Pizza Oven, Garden Grove, NY Fold, MYO Pizza, Baked & Battered, The LAB Pizza and the Villa Bianca Group. Finalists in The British Street Food Awards in 2015, Scream For Pizza from Newcastle was created in 2014 by partners, Vicky and Alex. Having trained a Michelin-rated pizzeria in Naples, they cater for events and weddings all year round, as well as having various regular spots around the North-East. Following numerous trips to perfect the pizza art, including a recent trip to New York, their traditional Neapolitan bases cross with unique toppings especially for MySliceFest. Based around West Sussex, The Pizza Oven quote their ethos as “street food, restaurant quality”. Converting the skills they have accumulated through years of cooking for their families, partners Emma and Helen created their brand back in 2012. Their converted van with a wood-fire oven enables them to travel and share their food with new people at festivals, local events and weddings. Thin and crispy slices are their speciality with the finest ingredients, many of which are imported from Sardinia and elsewhere in Italy. The travelling pizzaioli from Brighton, Garden Grove have been regulars on the festival circuit having traded at Glastonbury and many others across the UK and Europe since their launch in 2013. Conscious about the environment and helping their community; their vehicle mostly runs on biodiesel and they aim to donate any leftover food to FareShare, a non-profit organisation that fights poverty and homelessness in and around Brighton and Hove. As for the pizzas, customers should expect traditional recipes with a twist for today’s taste buds according to the founder himself, Stefano, who spent years with his family growing and cooking food from scratch in Greece and across Europe. American owners, Annabel and Michael, saw a gap in the market for the traditional New York style slices in London and so in 2015, they opened NY Fold. Working with master pizzaiolo, Bruno DiFabio, with 6 world pizza titles under his belt, the new Soho-based pizza brand was established. 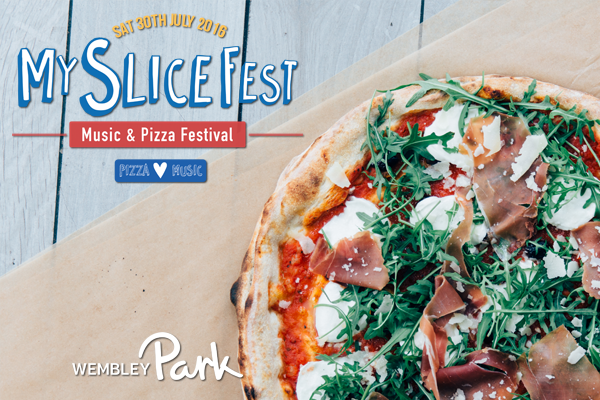 Festival goers should look out for their Big Apple style slices in a range of vegetarian and meat toppings on the day. Owner, Victoria, created MYO Pizza through a love of cooking, food and Italy and also writes a food review blog herself. The Salisbury-based brand are experts at Focaccia-style slices, similar to the street food of Rome. Victoria and her green renault estafette, Theodore, cater for food festivals, sports and private events, no matter how big or small – giving customers more choice to ensure a bespoke experience for each event. A takeaway shop, based in Cobham in Surrey, Baked & Battered’s pizzas are made by an award-winning chef, who regularly competes in internationally recognised pizza chef competitions. Authentic Neapolitan Italian pizza, using homemade dough, is prepared each day in their kitchens for a range of toppings, including the award-winning pizza itself – Pizza Del Campione. Their baked van can cater to private parties, events or fairs. This Hertfordshire-based vendor specialises in the production of organic gluten free pizzas, pizza bases and dough balls that are remarkably lower in fat, carbohydrate, sugar and salt. One of their pizzas gained a highly recommended score in the Free From Food Awards in 2014 and they will be offering a range of vegetarian and meat options at the festival – menu TBC. “Guilt free pizza… that promotes a healthy lifestyle without sacrificing taste”. A Italian family-owned small chain of restaurants based in Hampstead, London, the Villa Bianca group will be putting together a 10 oven set up to MySliceFest. With the Villa Bianca idea being developed in 1988, they have over 25 years of bringing great tasting Italian food to the people of North-West London. They’ll be serving the traditional Neapolitan-style pizzas that you can find at their restaurants (Peter’s, Piccola and Villa Bianca), along with new concoctions created just for the festival including Nutella dessert pizza. The full menus for each vendor will be available in July. Super Early Bird tickets and Early Bird tickets have both sold out, General tickets are now on sale for £25. There are Student tickets available for those with valid photo student ID for £15 and the last remaining VIP tickets (£49.50) which include priority entrance, a separate bar, private toilets and entrance to the artist hang out area. All ticket holders must be 18 or over. The festival will be open from midday until 9pm, however the entrance gates will close at 6pm. For more information including the line-up, tickets, FAQs and more, visit www.myslicefest.com.